"Delcam’s ArtCAM JewelSmith has made a huge positive difference to the way I work and has been a very worthwhile investment,” claimed Anthony G. Jacob from Glasgow’s Marant Jewellery. Mr. Jacob has been a designer/jeweller for over 25 years, specialising in one-off commissions from his shop on the south side of Glasgow, while also working with fellow jeweller, David Bercott, to produce larger volumes for his trade business. 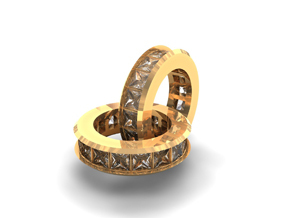 His work is all in gold, platinum and precious stones, but can range from the simplest of wedding bands through to complicated necklace designs. Before he added ArtCAM JewelSmith, time was always the enemy for Mr. Marant. Problems always arose from the man-hours it took to design each piece, make a silver master and then cast the design in the appropriate metal.